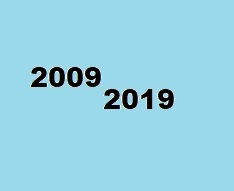 Do you wish that it was 2009 not 2019? - Amirite? - Post your opinion and see who agrees. Do you wish that it was 2009 not 2019? Nope. I've got less than a year before finally retiring. Now if you were offering 1979 I might be interested. I wouldn't mind starting over in my mid 20's. Ha! No, not really. I'm content with my older self .... and I'm glad to finally be retired. No, I'm OK with 2019. No way. I would be younger, but wouldn't want to have to re-live the last 20 months from hell. Yes if I can keep my memory so I will know what I should not do. Getting younger is always nice. I would really like to go back to 1960 with memories, wow an almost perfect life could be had. Sometimes, I wish it was 1969. Yes, because we would have Obama as our president. @dru18 Yes, because we would have Obama as our president. My 2019 self would have a field day with 2009! Oh heavens no. While 2019 got off to a rough start, things are going fantastic for me now.